Propaganda, known today euphemistically as ‘public relations’, is the manufacturing of consent. It’s the distortion of information to suit a particular agenda. Along with it’s ‘proper’ use comes the ability to control the masses, to mold the collective mind. Propaganda is all pervasive in our society and culture. We have trouble discerning what information is real and what is not. It’s become increasingly difficult to tell the truth from the lies, even with the power of the internet. Time has given these mind manipulators lots of practice to hone their skills. It’s important to realize the magnitude of manipulation that is being perpetrated against mankind. Things are not what they seem. The facts have been twisted and used against us and for private interests. What we think we know is engineered by these shadow figures, this invisible government that hovers over us, controlling our every seemingly independent decision. 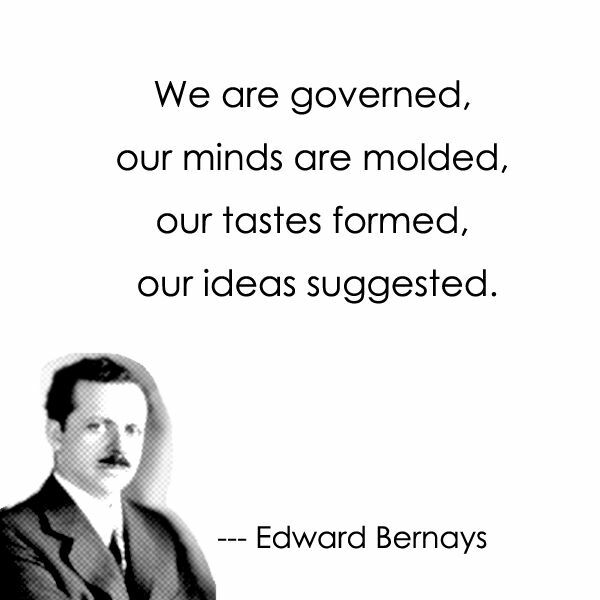 A man named Edward Bernays was one of the most prominent mind manipulators. Considered the “Father of Propaganda” he was hired by corporations and governments and used our human emotions against us, often for nefarious purposes that serve the elite and compromised the integrity of the common folk. He is the reason we put so much attachment on materialistic things. We don’t want a new car. We need that new car! His uncle just so happened to be the famous psychoanalyst Sigmund Freud, so he used his uncle’s psychological know-how to penetrate the collective mind. He shaped public opinion to suit the interests of whomever had the most money and power at the time. We can thank this guy for the public’s acquiescence to war, water fluoridation, bacon for breakfast, and the reason women started smoking in the 1920’s. He was hired by governments and corporations to sway public opinion on the side of the investors. This alludes to an inherent problem in our society. The corrupt system in place today that passes for capitalism and democracy always puts monetary incentives above the interests of the common man and health of planet Earth. One of the best forms of propaganda, if not the best, is the motion picture. Hollywood, movies, and cinema are powerful opinion shapers that prey on the subconscious mind. Consent is manufactured, our choices are made for us. Misinformation and disinformation are tools used by the orchestrators of the mind manipulation. When oppressive action is desired, acquiescence is created. It’s a lot like September 11th. Problem-Reaction-Solution. The Hegelian Dialectic. If these dark entities seek to gobble up the freedom of mankind an event must transpire to allow the citizens to beg for war and their liberties taken away. One of Bernays favorite techniques for garnering public opinion was appealing to the authority figure. If you can influence the leaders, either with or without their conscious cooperation, you automatically influence the group which they sway. In order to promote sales of bacon, for example, he conducted a survey of physicians and reported their recommendation that people eat heavy breakfasts. He sent the results of the survey to 5,000 physicians, along with publicity touting bacon and eggs as a heavy breakfast. Sales went through the roof. To Bernays it didn’t matter what was right, what mattered was the price of the job and the satisfaction of being able to brainwash the masses. He brags about this ability in his book Propaganda written in 1928. Most propaganda goes unnoticed as propaganda. For many people who still believe in vaccination, this is just another billboard^. Most people don’t see it for what it is. Propaganda is the act of deliberately spreading false or deceptive information, ideas, rumors, doctrines or principles propagated by an organization or movement to help or harm a target person, group of people, movement, institution, nation, etc. Psywar explores the evolution of propaganda and public relations in the United States, with an emphasis on the “elitist theory of democracy” and the relationship between war, propaganda and class. In 1917, at a time where the president was elected under the slogan”He Kept Us Out of War”, President Woodrow Wilson came out with what they called “Four Minute Men“. These were short films presented during the four minutes between reels changing in movie theaters across the country. These short mini presentations brainwashed the masses into thinking we should go to war with Germany. There were a large number of German Americans living in the states at the time so support for war with Germany was grim. George Creel, another influential propagandist who worked with Bernays, came out with these short wartime propaganda stunts to garner support for the war, and it worked like a charm. We all know plenty about the atrocities committed by the “bad guys” in WWII. (well after 1917 I might add). What we aren’t told however, is the horrible torture and deaths of millions of innocent German civilians. After WWII, when we defeated the “Axis of Evil”, President Eisenhower decided to deliberately starve over a million German men, women and children. Instead of quickly killing the people he put them in a field without shelter, food or water. That’s the cheapest and most effective way to execute a mass murder and that is exactly what he did. Of course we never learned about this in the U.S. school systems because we were the “good guys”. It really is amazing how much history or ‘his-story’ can be altered to suit a particular agenda. The saying “History is written by the victors” has never rung so true. Sometimes it isn’t the information that we’re told that sways our epistemological worldview, it is the information that’s suppressed and kept hidden deep beneath the collective consciousness. ‘Other Losses’ is a 1989 book by Canadian writer James Bacque, in which Bacque provides massive evidence that U.S. General Dwight Eisenhower intentionally caused the deaths by starvation or exposure of around a million German prisoners of war held in Western internment camps briefly after the Second World War. Other Losses charges that hundreds of thousands of German prisoners that had fled the Eastern front were designated as “Disarmed Enemy Forces” in order to avoid recognition under the third Geneva Convention, for the purpose of carrying out their deaths through disease or slow starvation. Other Losses cites documents in the U.S. National Archives and interviews with people who stated they witnessed the events. Besides Eisenhower’s death camps there were countless other atrocities committed by the ‘good guys’ in WWII, including the bombing of Dresden. These war crimes, where literally millions of German women and children were raped and murdered, are never portrayed in Hollywood blockbusters or BBC documentaries. These war crimes are in fine print or missing all together in the history books which were of course written by the victors of the war. We never hear about the plight of the German in WWII, only the suffering endured by the “good guys”. Have you seen any WWII movies lately? There are about 1,488 trillion of them and they all concentrate on the evil of the NAZI’s while ignoring the evil they themselves perpetrated. Over 10 million German civilians died in WWII, but their deaths were somehow justified because of the actions of one man. They called World War II the ‘Good War’, because we had to defeat the ‘Axis of Evil‘. As it turns out, the Allies might have been the most evil of them all. The war crimes committed by the Rothschild backed countries of this so called ‘Good War’ remain today as some of the most heinous crimes ever to be recorded in human history. German cities were decimated and millions died. It has been determined that the bombing of Dresden, a 100% civilian city with no armaments, was destroyed in such a fashion, that men, women, and children were burned alive, and it has been officially labeled a “holocaust” or “whole-burning”. War is profitable, very profitable. The evil forces that pull the wires of our society, this ‘shadow government’ as Bernays put it, control every facet of our lives, but only if we let them. If we educate ourselves of the inner workings of our society, and as C.G. Jung put it “make the darkness conscious”, we can rise above the restraints of mis and disinformation, lies, deceit, and propaganda. We’ve really only seen propaganda that furthers nefarious and sinister agendas, however it can be used to promote well being and altruism too. Pejoratively known as ‘marijuana’, this innocent “drug” has never claimed one life due to its direct use. Aspirin and Ibuprofen claim thousands of lives annually and you can get these at any convenience store. Cannabis is a schedule 1 drug meaning it isn’t supposed to have any medicinal benefits. Meanwhile half of the states in the US have passed medical allowances for this altruistic herb. The hypocrisy of united states government can be found at their patent office, where they hold multiple patents for its use medicinally. Cannabis was a threat to many industries, due to its practical use to make just about anything. Jack Herer, in his book ‘The Emperor Wears No Clothes” covers the vast uses of cannabis. Propaganda is everywhere and it’s filled with logical fallacies which run amuck in our society. These flaws in reasoning go unnoticed and sway the public’s opinion. The Trivium is an excellent technique to sift through the BS, and form a solid understanding of what is true and what is not. It’s vital that we learn these methods of manipulation that are being used against us. When highly manipulated and biased information passes as sacrosanct fact, all kinds of nefarious agendas can be carried out. Money talks, and often in a way where it’s trying to get you to do something your don’t want to do. Humans are just that, human. We are mortal. We make mistakes. But it’s important to recognize these mistakes as to not repeat them. Otherwise we remain cogs in the machine; victims to the mind molders, and contributors of our own demise. brainwashing, disinformation propaganda, eddie bernays propagada, edward bernays, Ivy Lee propaganda, joedubs.com propaganda, manufacture consent, obfuscation, propaganda, Propaganda: Mind Manipulation & Manufacturing of Consent, upton sinclair, wake up world, walter lippman propaganda, www.joedubs.com. Bookmark. Serendipity led me to the “Number 9 Code”, then to this awesomely fascinating website – thanks joedubs!! Pingback: Are Humans Frugivores & Designed To Eat Mostly Fruit?